Designing elegant, functional landscapes for outdoor living. A series of stepped outdoor rooms maximize the clients' use of the exterior space on their steeply sloping lot. The outdoor living areas are large and accommodating with plenty of room for entertaining, play and gardening. The garden features an outdoor kitchen with pizza oven and a dining table that converts to table tennis. 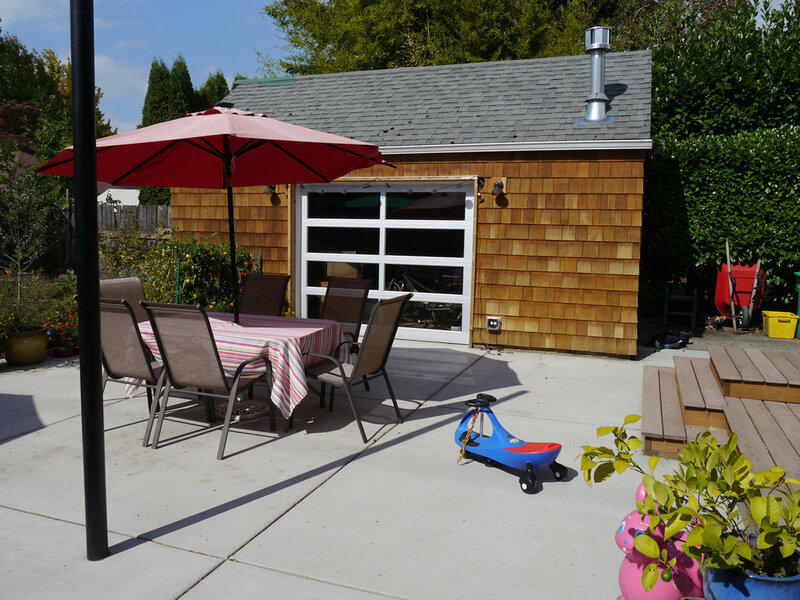 From the built-in bench surrounding the fire pit, there is a stunning view of Mount Hood. Raised planters for vegetables and herbs set into the hillside complete the garden. 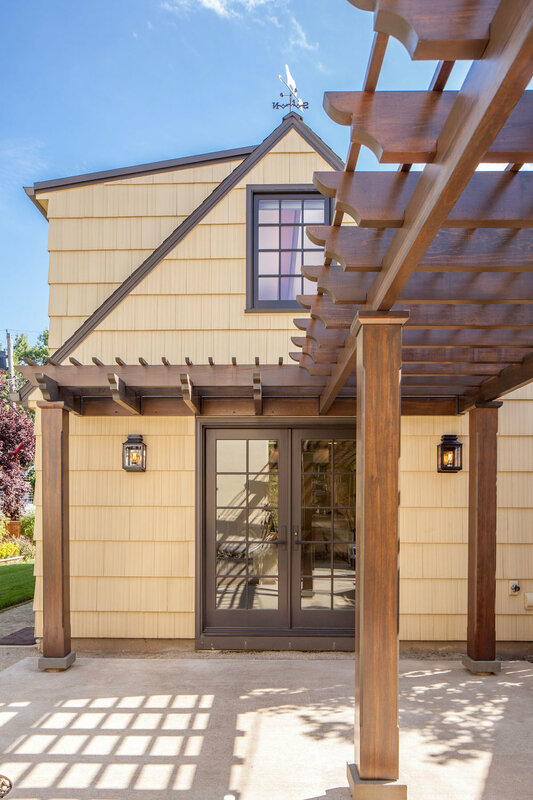 The Tuscan-inspired house situated on the Willamette River was built in 2016 by Riverland Homes. The riverfront site is abundant with natural beauty with a spring-fed pond that was enlarged and planted with native grasses and perennials. Elegant, formal plantings at the front of the house blend with the architecture of the home. Landscape installation by Showscapes, Inc.
For this riverfront home, we designed elegant, formal surrounding plantings in keeping with the newly added Tuscan-style stone facade and cast stone details. Topiary boxwoods in beautiful stone planters frame the architectural features. At the back of the house, surrounding the swimming pool, the beds were completely replanted to open up the river view, add vibrant color, and some drama with a rich, varied palette of plants. We provided landscape design services from schematic design through construction administration for a picturesque hilltop estate with breathtaking views of Mount Hood. The landscape includes a fountain terrace, formal event lawn, fire pit, woodland garden, and walking trails throughout. The extensive gardens feature classically formal beds, cottage-style perennial borders, and naturalistic plantings. We help create functional and budget-friendly landscapes for families, without compromising the beauty and aesthetics of a well-designed garden. Relax and entertain in a comfortable outdoor living room, kitchen or fire pit area. Enjoy year-round harvests with a bountiful, edible landscape. Our planting designs feature drought-tolerant, low maintenance plants that provide four seasons of interest. Incorporate a rain garden, native plantings, and other sustainable landscape features. Contact us for a no-cost initial site visit. We want to help you create your dream landscape! Garden for a young family. Newly constructed home in Salem, Oregon. Eye-catching plantings, a meandering walkway, and a rain garden replace unwanted lawn. A relaxed, party-sized patio, edible landscaping, a functional rain garden, plus plenty of space to play help make this garden just right for everyone in the family! The labyrinth is the focus of the rear courtyard, a welcoming space created by the addition of a massage studio and office wing on the back of the house. Floor to ceiling Fleetwood sliding doors and an unencumbered view across the labyrinth connect inside to outside. Surrounding the front terrace of architectural concrete slabs are lush flowering and evergreen trees, shrubs, and grasses that provide a rich four season tapestry of color, fragrance and texture. Screened from the street, its open aspect, and eastern exposure make the front terrace a good spot for coffee on a sunny morning. 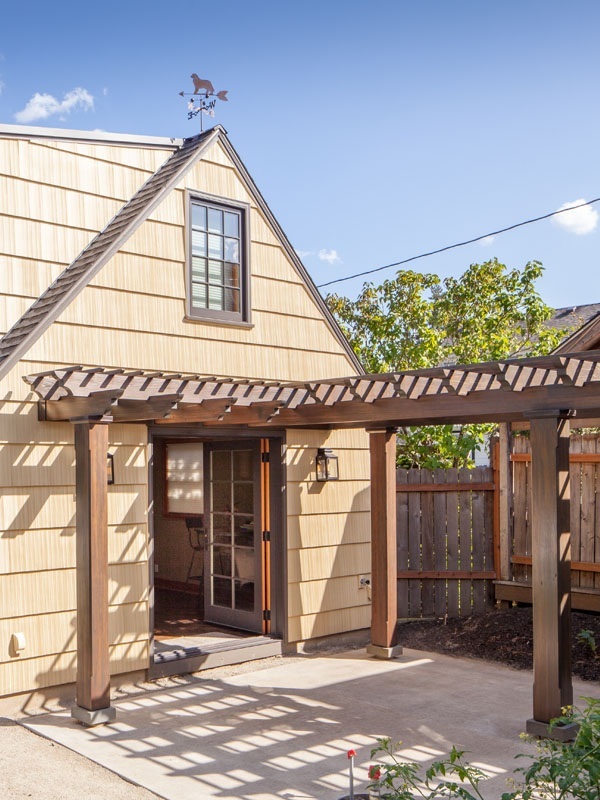 The arbor was installed following a complete renovation of the garage to create a two story studio with office space and full kitchen. The arbor is covered with a clear, acrylic polycarbonate roof to provide an all weather connection from the house to the studio.